Make the bouncing balls script more interesting. Submitted entries will be run during the Workshop and everyone will vote for the winner. FOR EXAMPLE: One-year subscription to Wired Magazine (US$10 value). Email your script as an attachment to workshop_organizer@institution.edu. To make life easier please name the script “bounce_<yourname>.py” before attaching. The deadline for submission is TBD. 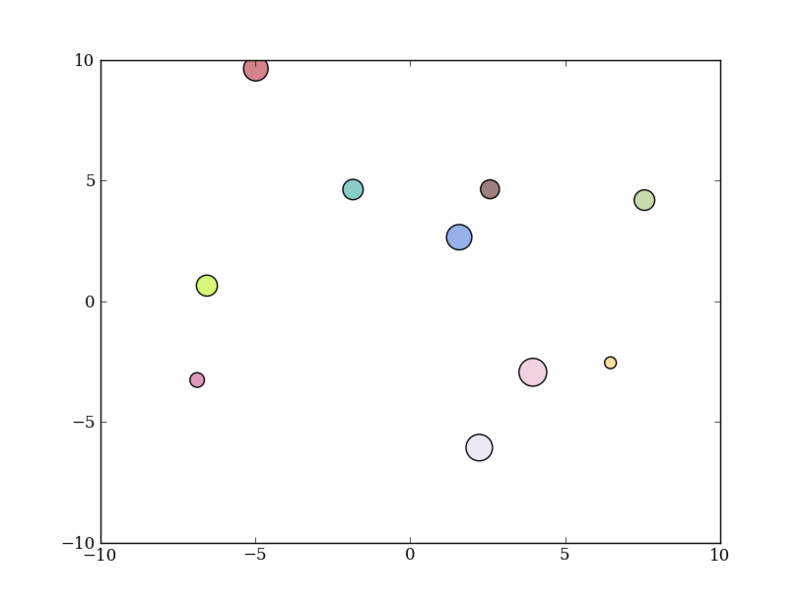 The script below shows a simple example of making an animation using matplotlib. The key feature is the draw() command which re-draws the plot window. # Define properties of the "bouncing balls"
# from 0 to 1. Alpha is the transparency. # manipulation of the plotted circles. This command essentially runs the lines of the file as if you had entered them by hand, but this now allows for longer scripts. This has the convenient property that all the variables defined within the script are available at the command line once the script finishes execution. Use this to examine key variables like pos, sizes, colors to understand how the script is working. The key plot routine being called is scatter(). Read the documentation and understand how it is called. Examine the circles object with help and ?. Look for “set_*” methods (circles.set_<TAB>) that will let you set something and then get help on those as well to learn how to use them. There are corresponding “get_*” methods that let you examine the existing values. Put in animated text with the text() command. You’ll need to do something like mytext = text(...) and then figure out how to change the properties of the text (e.g. rotation angle) using mytext.get_<TAB> and mytext.set_<TAB> and help mytext. Do silly things like make the tick labels change colors and/or spin following the example code at the end of the Axis containers documentation. Put in physics, like making the balls bounce off each other, including gravity, or ??? Below are the entries that were received for the contest. Thanks to all who submitted an entry! © Copyright 2011-2015, Smithsonian Astrophysical Observatory under terms of CC Attribution 3.0.